The purpose of Plan West Ashley is to set policies and identify future public and private actions aimed at enhancing quality of life and protecting the area’s historic, cultural and natural environment. With a history spanning over 300 years, West Ashley is the founding site for the State of South Carolina, containing great neighborhoods, parks, and a growing and engaged community. The close of the 20th century saw tremendous growth and fast expansion. 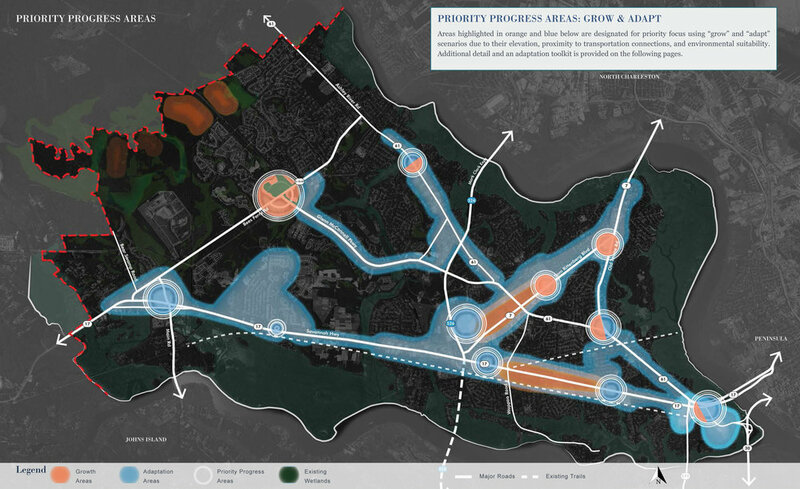 Plan West Ashley aims to direct growth and maximize prosperity while minimizing negative impacts of future development. It does this by calling for complete, livable neighborhoods, better connected to parks, open spaces, and their surroundings, designed with environmental sensitivity. At the same time, the plan calls for leveraging new mobility technology and making small interventions in existing residential subdivisions, to give more people more chances for walking, biking and using public transit. 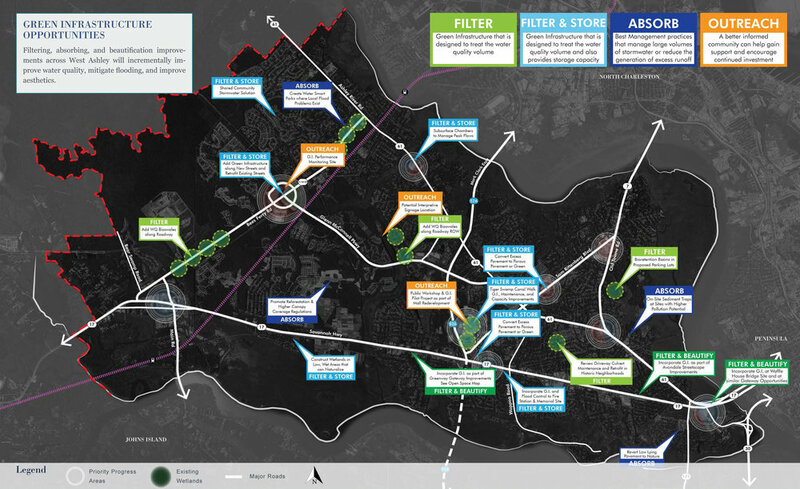 The Plan for West Ashley was endorsed by the West Ashley Revitalization Commission and Charleston Planning Commission; the Plan chapter overviews and implementation actions were adopted in March of 2018 by the Charleston City Council. BELOW: Left: Citadel Mall, existing conditions. Right: Citadel Mall, potential future conditions with new mixed-use development that includes workplaces, residences, and improved transit access. BELOW: Left: Savannah Highway at Wappoo Road, existing conditions. Right: Visualizing potential future conditions. Improved street design and new development on inner West Ashley’s commercial corridors can contribute positively to community character. 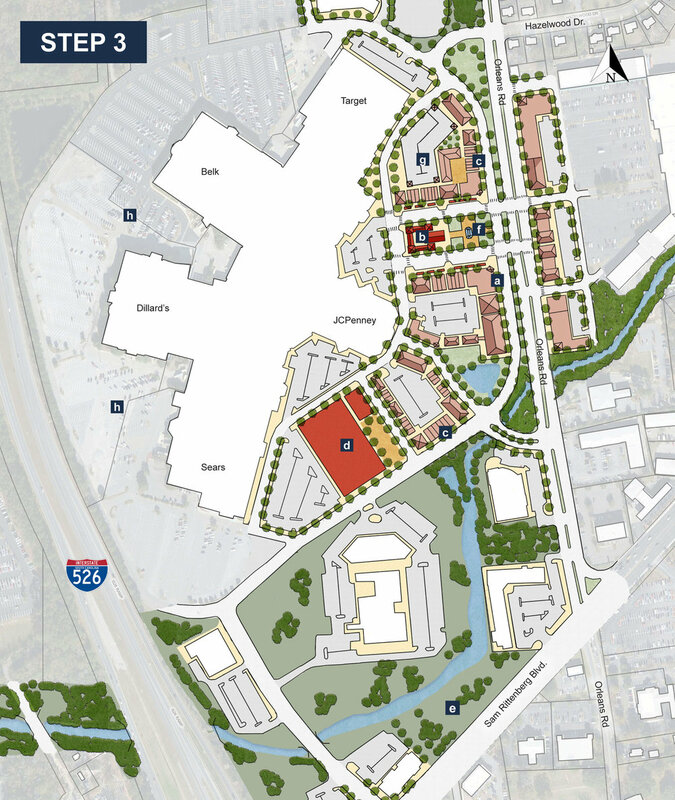 BELOW: Changes at the Citadel Mall and surroundings would likely happen in stages, over time. Step 1 shows potential for new walkable and mixed-use development in place of a portion of the existing parking lot; this could accommodate new workplaces, residences, and a transit hub. Step 2 shows over time, longer-term goals could be achieved, including additional potential building sites as well as the enhancement/restoration of natural areas.